At a recent beauty event, I heard from a skincare specialist that, thanks to our urban environment and the stressors that come with it — whether it’s pollution, or the fast pace of living, or even blue light from our screens and smartphones — we’re more prone to premature skin ageing than ever before! Not to be a downer, but that’s a reality we’ll just have to deal with, along with the common issues of ageing skin: wrinkles, fine lines, saggy skin, pigmentation. If you haven’t been thinking about an anti-ageing routine in your skincare lately, it starts now. 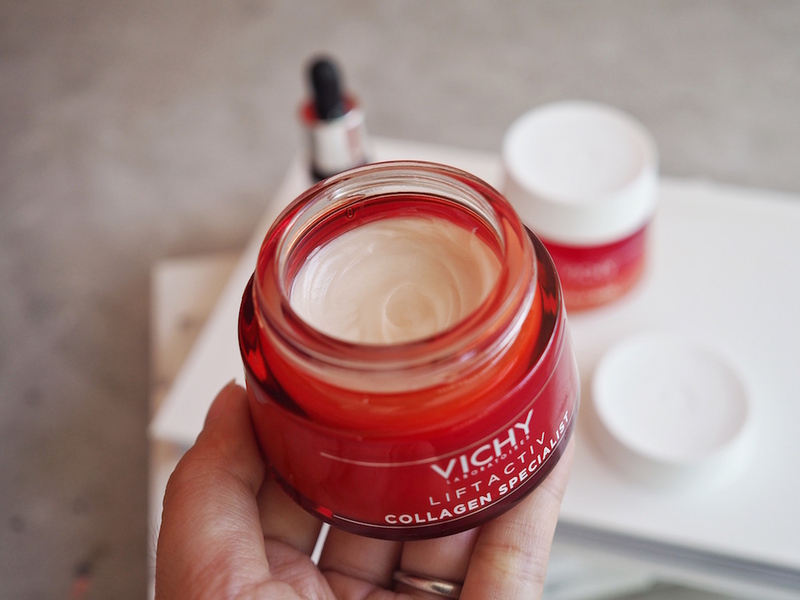 Basically, we could all use some help, which is why it was a blessing when Vichy sent over their latest skincare range. 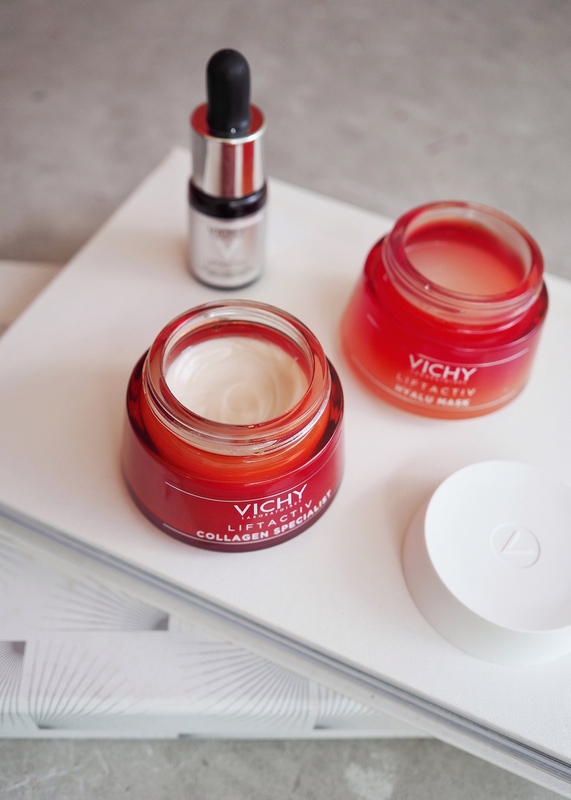 Sure, a lot of anti-ageing skincare comes by our office every week, but this stands out because of this — the two new items in the Vichy Liftactiv Specialist range are inspired by new-generation aesthetic procedures, and offer all the benefits without the hassle or scary factor! 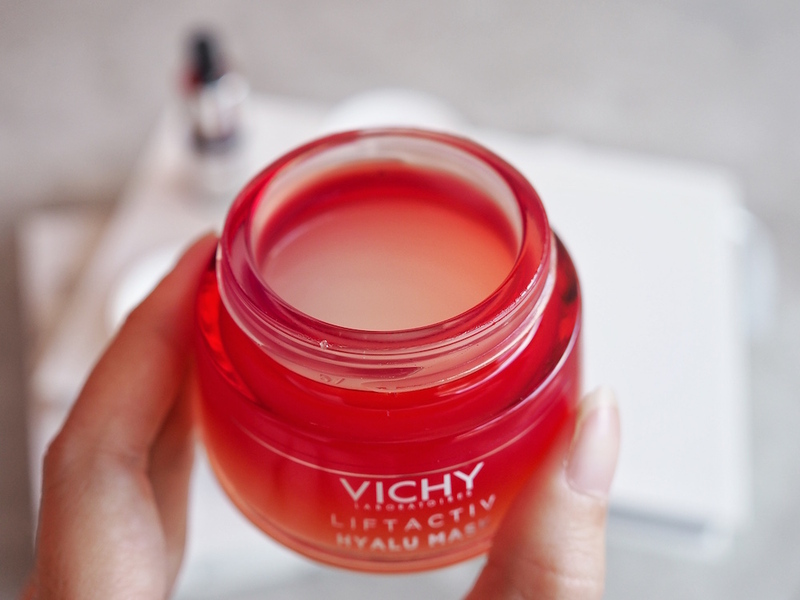 Of the three items, the latest ones are the Vichy Liftactiv Collagen Specialist, and the Hyalu Mask. The first one’s a cream that’s inspired by the tissular induction procedure (or rejuran) that stimulates collagen production for firmer skin, while the Hyalu Mask is inspired by biorevitalization, or more casually termed, filler injections. These typically provide your skin with deep hydration, by way of injecting hyaluronic acid directly into the skin. We’ll first delve a little on the aesthetic procedures themselves — the very thing this new skincare range is inspired by. You might have noticed that there has been an increasing trend among Singaporeans doing non-invasive, or minimally-invasive, procedures. In fact, talking about an appointment with your aesthetician seems to be a normal subject at dinner tables; it’s no longer taboo, nor really frowned upon. While short-term procedures such as beauty fillers — probably the most common — are mostly safe, with little side effects or downtime these days, you might still end up worrying if you’re a first-timer looking for a skin specialist you trust. I’ve personally never done any of these procedures, so it’d take tons of research and convincing before trusting someone with my face! Now, both rejuran and fillers might sound daunting or totally normal, depending on how much of a skincare enthusiast you are, but we can bet they don’t come cheap too. Occasional treat, maybe? But not an everyday affair. Which is the great thing about Vichy. With powerful skincare actives in their skincare items, the brand manages to make the benefits and effectiveness of the aesthetic procedures accessible to us, in a safe and more affordable way. The premium dermabrand makes sure they use medical-grade active ingredients as well, which are tested on sensitive skin for safety, so we can be confident that our skin’s getting the best care possible. Basically, you don’t need to put yourself at risk (of all the fears of side effects and downtime), and you still get the full benefits! 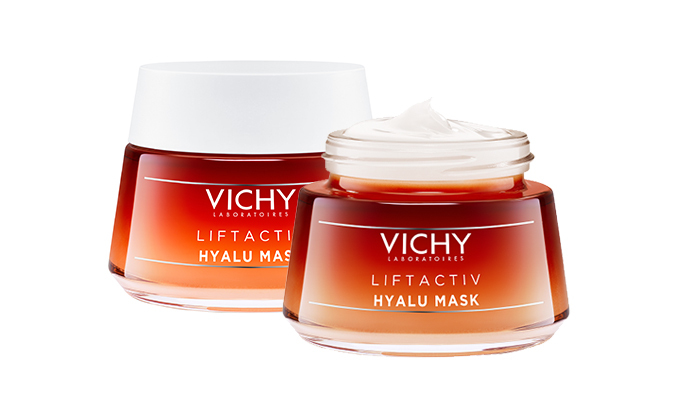 Vichy Liftactiv Specialist Series: Collagen Specialist ($72), Vitamin C Skin Corrector ($52), Hyalu Mask ($62). Here’s the recommended routine: three products that contain powerful actives to help our skin fight against those signs of ageing. You can find out more about the Vitamin C Skin Corrector here, but I’ll be diving right into the two new items, especially since I’ve given them both a good go. Think of this anti-ageing cream as your daily collagen boost. You already know that our skin’s natural ability to produce collagen — what keeps our skin young, supple and smooth — declines as we get older, starting from as early as your mid-20s, so we need all the help we can get. This contains both a Vitamin C derivative, a powerful antioxidant that helps with brightening, as well as Peptides that are effective in stimulating collagen production, as if to power up our skin to do more of what it already naturally does. When this happens, we get skin that’s smoother and more firm, less saggy, while we also see less obvious fine lines and wrinkles! At first swipe, the moisturiser has a consistency that’s richer than what I expected, similar to how most firming night creams are. There’s a faint floral-musky scent that you’ll have to get used to, but otherwise it’s all good once you smooth it onto your skin, and it does feel nice to massage in something this smooth! You can glide the cream across your skin, the texture’s almost like butter which then melts into a velvety powder-like layer the moment it touches the skin. I was then surprised at how it got absorbed into my skin. After a few seconds, it sinks into my skin, leaving behind a vastly softer surface that’s not at all tacky — you won’t even feel it sitting on your skin. I first used it at night and loved how my skin’s immediately hydrated and plump and silky-soft. It’s not overly rich such that the skin feels heavy too; the cream settles in weightless. Best part is, the firmness that I felt in the first few minutes doesn’t dissipate when I wake up either: in the morning, my skin has that same velvety-smooth texture despite my not-so-great air-conditioned environment. In the end, how effective this is depends on whether it works over time, that is, if I can achieve brighter and more youthful-looking skin after sticking by it for a few weeks. While the immediate plumping effect it had on my skin is certainly impressive, I can say that I’m pleased with how my skin now looks more hydrated and lively in the mornings, all on its own! To note: in the day, the rich cream also manages to feel light on your face, and even creates an even, matte that’s perfect for makeup application. I noticed that its hydrating effects were more long-lasting too! Now, even without any product on, my complexion appears healthy, and I can feel how firm my skin has gotten. Basically, it’s not just a superficial effect! I can’t say much about the fine lines around my eyes (that requires eye serums/creams), but I’ve seen how the laugh lines around my mouth area have diminished as well. This is no quick fix of course, so if you’re yearning for results, do stick to a consistent regime. While the earlier product promised a collagen boost, the Hyalu Mask is inspired by filler injections for a boost of hyaluronic acid, an essential, natural substance in our body that’s responsible for well-hydrated and healthy skin. Now, the term ‘hyaluronic acid’ should sound familiar because it’s already present in a lot of hydrating moisturisers. What you must know is that with age — along with stressed and tired skin — we start to lose more of it in our bodies, which results in anything from dehydrated skin to fine lines and uneven skin tones. 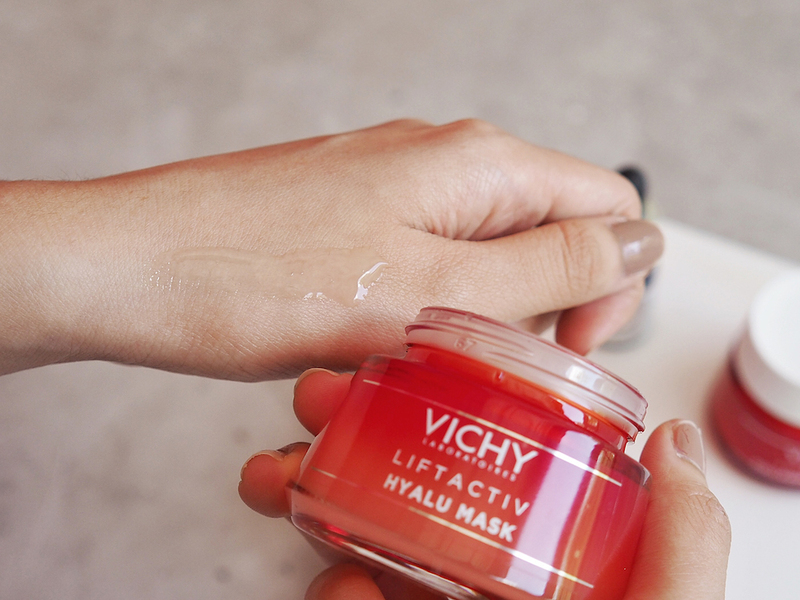 Vichy’s Hyalu Mask is useful for that since it combines natural-origin hyaluronic acid, both high and low weight, with agave yeast extract (that helps protect natural hyaluronic acid in your skin) for the most hydrating and replenishing formula. And if you’re wondering how “inspired” the mask is by the aesthetic procedure, well, they actually matched the dosage of filler injections with the same dosage of hyaluronic acid — at a concentration of 1%, only this time it’s available in a jar! What you’ll find when you first open the jar is this pristine gel surface. The clear gel texture is as expected — lightweight, very smooth, and cooling on your skin, truly nothing to complain about. It’s nice how even with the 1% dose of active ingredients — which matches filler injections, by the way — the skincare creators managed to retain such a pleasant watery texture. It didn’t take much for the mask to melt in either, and what I got was an instantly smooth effect on my skin as well. The instructions say to apply a thin, even layer on clean skin, and to leave it on for five minutes before gently removing the excess with a damp cotton pad. Please don’t wipe it off or rinse your face with water! That’ll defeat the whole purpose of the mask. On my first time using the mask, I also got a little paranoid because there was hardly any excess — or maybe my skin was that dehydrated! I’ve read that it’s normal though; also it must mean that my skin’s really benefitting from that extra boost, and I’ve noticed the difference. After just five minutes, my skin feels way more supple and soft. I’d recommend this as a quick skin fix, which is exactly why I love masks so much, because of how instant the effects are. I really liked how quickly the mask works to revitalise my skin, and in the most comfortable way possible without leaving any heaviness or residue behind — like I said, my skin feels supple, its texture more even and smooth, and it looks brighter and more refreshed as well! While I usually prefer sheet masks, I thought that this did better on two points: one, it works faster with the same intense plumping effect you’ll get after maybe 20 minutes of sheet-masking, and two, you wouldn’t be left with a sticky residue that might be unpleasant before you head to bed. You may use it weekly, or even three times a week. Of course, I’m not even talking about the best part of this either: you don’t need to head to an aesthetician to get that boost of goodness right at home! 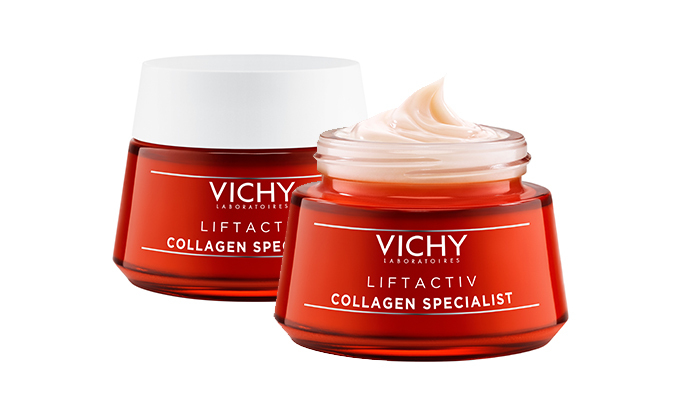 Vichy Liftactiv Collagen Specialist Cream, $72 for 50ml, and Hyalu Mask, $62 for 50ml. Available at Guardian, Watsons, Robinsons, Lazada and Shopee. 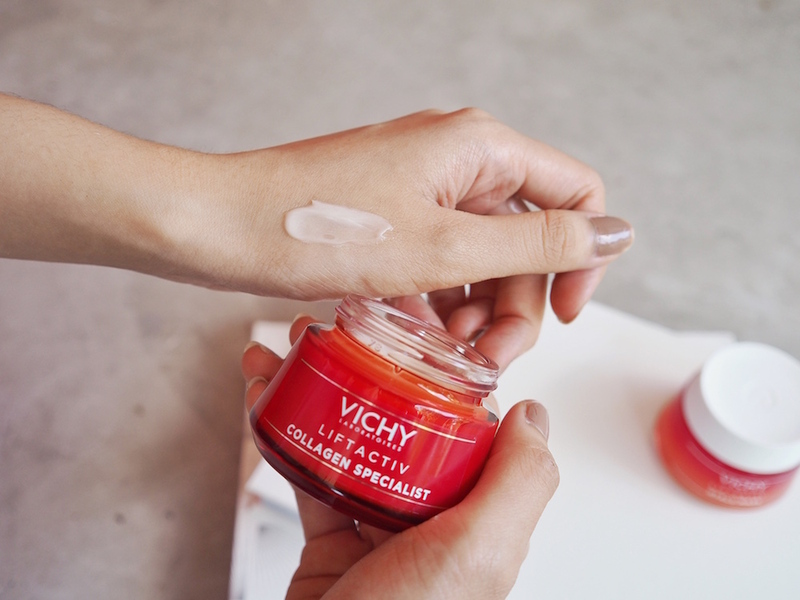 Save $10 off the Vichy Liftactiv Specialist series from 1 – 30 April. Receive a gift worth $11 with every purchase.